This hearty dish is rich and filling, without being too heavy, and will have everyone coming back for more! It’s pretty quick to assemble, and most of the time involved is baking it, but best assembled the day before. Preceded by a garden-fresh salad, it was an ideal dinner for a brisk late-spring evening (although the original recipe intends for it to be used as breakfast – I say, it works fine for any meal). In a saucepan, saute the leeks in oil until translucent. Add the sausage and cook until brown. The original recipe also calls for cayenne pepper for some kick, but we used hot sausage, so I didn’t add any more spiciness. Remove from heat. In a medium bowl, whisk the eggs, milk, and cream together (I just eye-balled the milk and cream – you don’t need to be precise), and add in some salt and pepper. 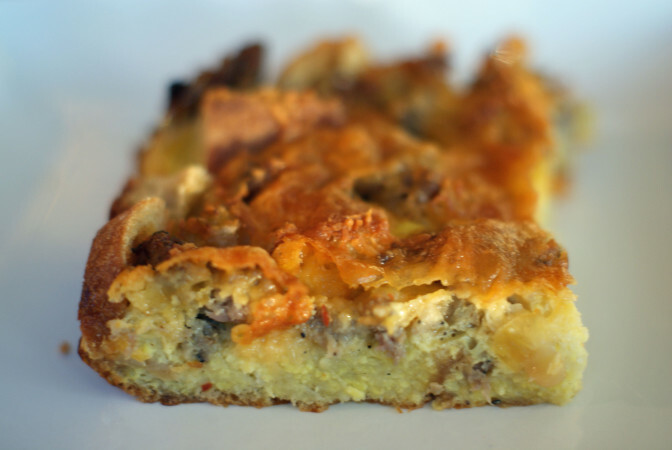 In a glass 9 x 9 baking dish (I actually used a 9 x 13 and it was fine, maybe just cut down the cooking time by 5 minutes), place the cubed bread, top with the sausage and leeks, then the egg mixture, and finally, sprinkle the cheese on top. Cover and refrigerate overnight, or at least a few hours, so the liquid gets soaked up a bit. Bake at 375 F for about 45 minutes, or until a knife inserted into the middle comes out clean. Let it cool while you eat your salad, cut, and enjoy!